Intel Corporation designs, manufactures, and sells integrated digital technology platforms worldwide and is the world's premier microprocessor manufacturer known for it's "Intel Inside" campaign. 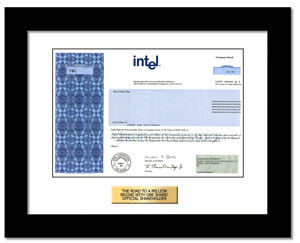 Important Note: Intel does not issue paper stock certificates and registers ownership electronically instead. The recipient still becomes a real shareholder of Intel Corp. with all associated rights. Please review carefully. Info is used to register the stock and may appear on the stock certificate. -- INCLUDED in price. Max 35 characters per line. -- Don't worry about centering, we center and engrave in all CAPS. -- Check spelling - what you enter is sent directly to engraver. -- Offset mat used for all orders. -- Put cursor in middle of line 1 and begin typing. Our office will be closed Monday, Dec 25, for the holiday. We highly recommend selecting 2 Part Delivery. Plenty of time for this smart gift. Still time for this smart gift. Click on ? for audio or hover on for text. Can I buy more than one share? I'm in a rush, what options do I have? How do I keep it a surprise? Enter the shareholder's address on this page (required for registering the stock). You will be asked for a billing address and a	shipping address (which can be different) on a subsequent page. Copyright GiveAshare.com ® /Leading Edge Gifts LLC 2002-19. All Rights Reserved. GiveAshare.com is a gift website owned by Leading Edge Gifts, LLC. All names and logos displayed on this page are owned by their respective organizations. GiveAshare is not affiliated with these companies. We provide an innovative gift by allowing customers to easily and affordably buy a real share of stock as a gift. Although this is real stock, we do not market our product as an investment nor do we in any way provide investment advice. GiveAshare is not a registered broker-dealer and carefully follows rules established by the SEC for us. We recommend that those looking for an investment contact a registered broker or financial advisor.